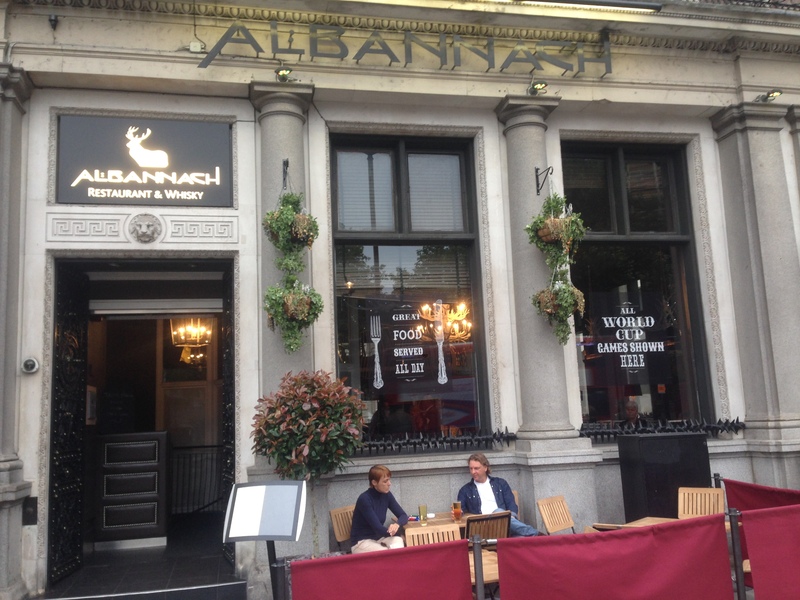 Albannach | Restaurants of the World Unite! 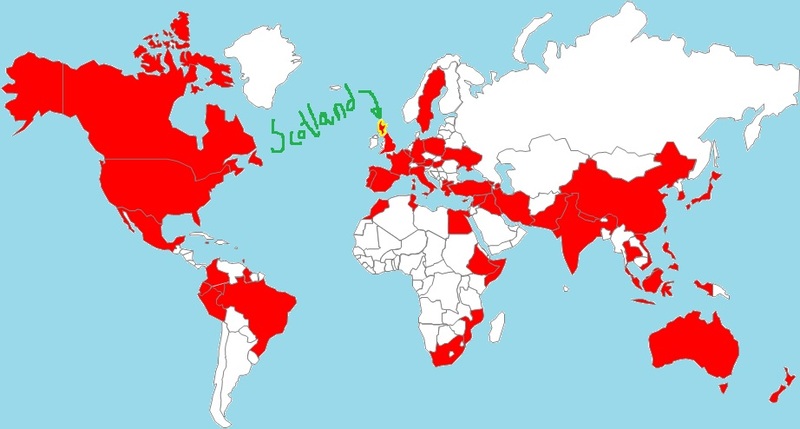 There’s been a lot of debate about whether Scotland is a real country or not. The jury’s out and no amount of devolving is going to clear this matter up. In my experience, the last thing Scottish people need more of is devolving. Don’t worry, I know this sounds insulting, but those Scottish that can read have left Scotland and 90% agree with me so I’m quite safe. But thanks. Like most places, except St Andrews, London is crawling with Scottish people and so it makes sense that they would have a couple of restaurants around so that they don’t have to travel 8 hours up the A1 to remind themselves of why they left. 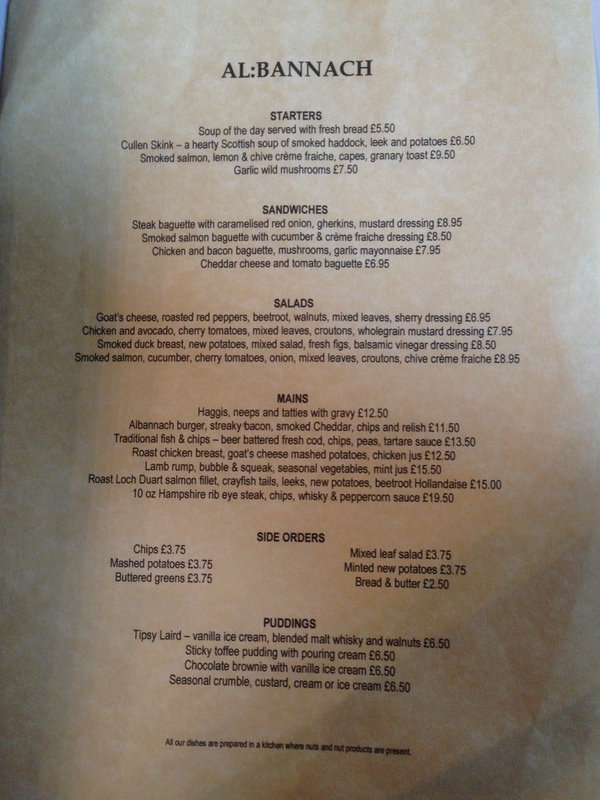 Scottish cuisine is to food what bagpipes are to music: tangentially related. I kid of course, I’m a fan of haggis, square sausage and fudge doughnuts. I also love 80/- but that seems harder and harder to come by up there now and is non-existent this far south. Mainly, it’s the whisky. Me and Sil kicked off with some excellent whisky cocktails on our visit to Albannach (http://www.albannach.co.uk/). It’s off Trafalgar Square (that’s posh for you!). 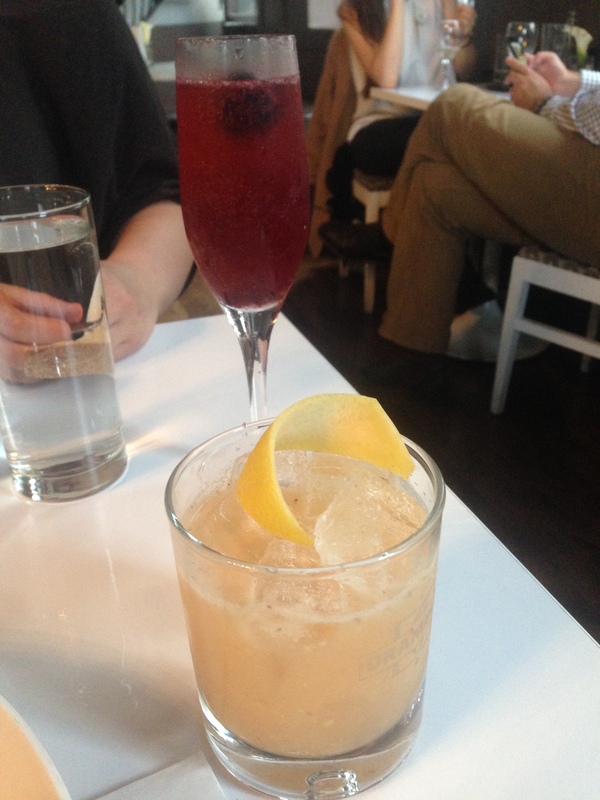 I can’t remember what we ordered, but Sil accurately described mine as a cold hot toddy and hers was a very refreshing Bellini-like concoction. 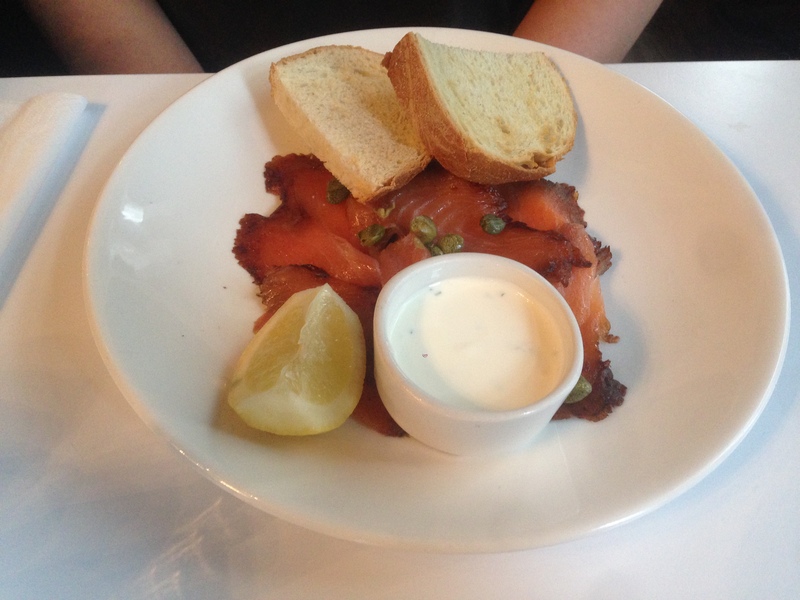 The food was fine: some smoked salmon for her and truly unexciting clay lozenge of haggis with neeps and tatties – I don’t know where they get their words from. There’s perfectly good English words for these things. Turnips and potatoes. These people get free university. £43 was a bit much, but it seems like a nice place for a pre-theatre drink in the future and I didn’t begrudge the service charge as the waitress was very bubbly. Boisdale (http://www.boisdale.co.uk/) also does Scotch food, which I’ve enjoyed massively with Mrs Del Monte in the past. Knockers raves about the Boisdale in Belgravia, but then that’s pretty much how she talks anyway. It could be that she hates it. There’s no way of knowing. Cocktails. Expensive, but lovely. I didn’t get a photo of the cocktail menu, but it was extensive and had a whisky-specific section. Like Scotland itself. Salmon with “granary” bread. Not granary more like. Excellent put down, Del Monte. What else have you got Albannach? I’m on fire! Yo mama. You can’t polish a turd. 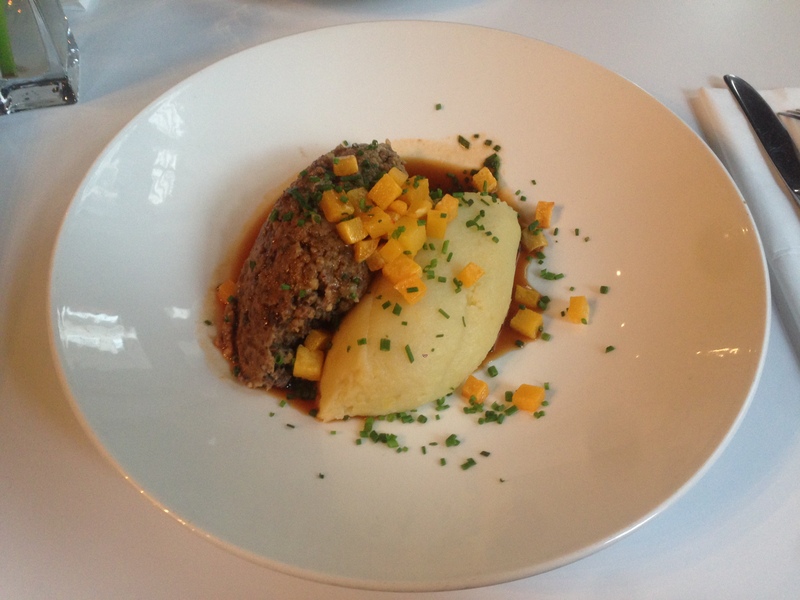 Fancy up haggis any which way you like, it still looks like a posh school dinner. Actually, I expect the Old Etonians and Harrovians among my readership (about 75%) are now salivating with memories of coq au vin, slow-roasted lamb-shank and compulsive fagging. Brown was a poor choice for the paint job, but it does mean you can see my patronus more clearly. I’m sure sitting outside looking up at Nelson’s Column would be a lovely way to enjoy a tipple or some nibbles, apart from the fact that you be constantly beset by a of stream slack-jawed tourists gawping at the trappings of Imperial Britain. 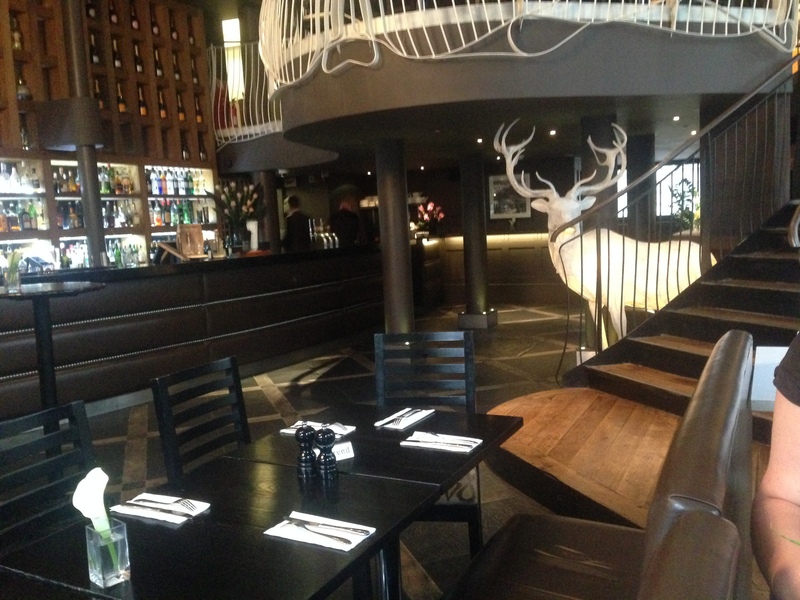 Maybe at every table a basket of rotting fruit and eggs to hurl at passers-by, Albannach. just a suggestion, no need to thank me. OK: free booze. ← Say it loud: I’m back and I’m proud!